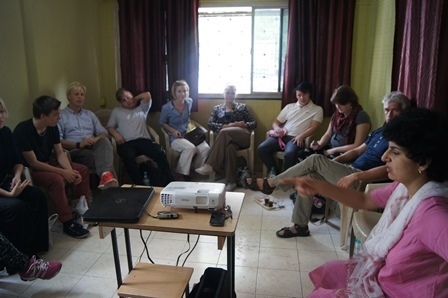 A delegation of 9 students and 2 teachers visited Pune on an exchange program from 28th September to 18th October’14. The group came under a course named ‘Youth Culture’. Their focus area of study was intercultural studies, visiting youth organizations, youth in politics; understand the matters of concern for the Indian youth, to know how the youth here spends their spare time. They were from Grade 11 and 12 and in the age group of 17 to 19 years. A comprehensive program was planned for them which covered most of their objectives. 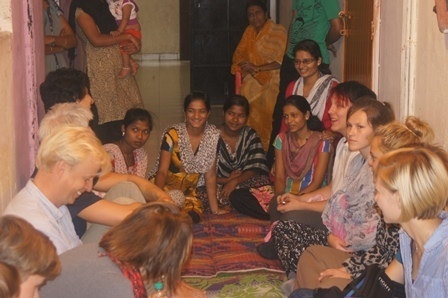 In order to get acclimatized to the new place, culture, surroundings, people, the group stayed at a reputed service apartment for the first four days. They then moved into Host families (TOS students of Grade IX hosted them) as this is one of the best ways of getting a firsthand experience of a country’s culture, values, traditions and customs. They soon become a part of the family and it was wonderful to see the bonding between the kids and the other family members, the love and affection that was showered by our dear parents, the yummy tiffin boxes that was packed diligently each day by the host mum for their guest child. The study visit began with an Orientation, school presentation, school tour and a tea party with the host families so that they could interact with each other informally before moving into their homes. Both the groups i.e. the Swedish students and the TOS host students along with their teachers went for a Signature Heritage Walk organized by Janwani. This gave a glimpse of the monuments of Pune City, thereby acquainting them to the rich heritage and culture of this city. A cultural program was also organized after the walk. The group also had a glimpse of the Navratra festival at various places in Pune. 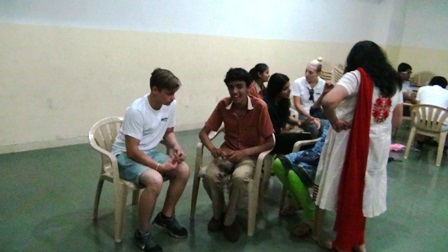 The students had some classroom interactions with our students, attended a few classes as well, eg. Art, Dance, Music and also went to Balewadi for the sports classes. 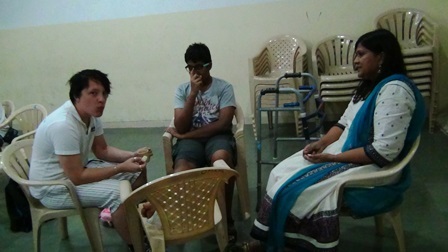 They attended two culture seminars by Lakshmi di. A few lectures were planned for them by our TOS teachers, namely on Indian Religion, Youth in Socio – Political Space, Gender Issues and Masculinities. A few visits to various organizations were also scheduled, such as visit to Indradhanushya a centre for environment awareness, Alert, an NGO working for environmental issues and Smile an NGO working with women to make them self-sufficient, CYDA, Cente for Youth Development and Activities followed with a visit to PCMC school and community, visit to a NGO, ‘Santulan’, a rehabilitation center which offers street addicts and the destitute, a roof over their heads, medicines, counselling and food. Santulan also helps them get off the drugs by offering detox, and a chance at a new life through vocational training and employment assistance. The objective behind these visits was to get an overview as well as interact with youth volunteers working for the various causes in India. They visited Ralegan Siddhi - model village - a village that shows the real meaning of development – pioneered by a single man Mr. Anna Hazare – social activist. They met him and a good interactive session as well. They also visited DSK International Campus which offers professional courses in the flourishing fields of Animation, Game Design & Industrial Design. As a closure to this program, the group very enthusiastically shared their experiences with our ninth graders. The presentation was well knit and covered all aspects of this exchange program as well as the learning outcome. On the day of their departure from Pune, the group bid a tearful adieu to their host families and promised to keep in touch and be friends forever. 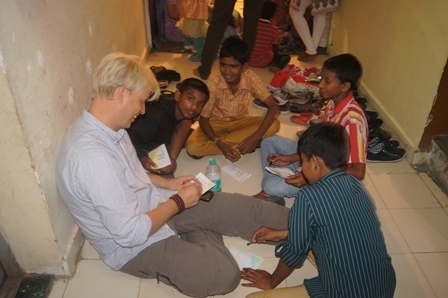 After a 2 day stay in Mumbai where they also visited the Dharavi Slums to get a peek into the economy generation ventures which is one of the USP of the biggest slum in Asia, the group left for Sweden. This exchange program is an excellent learning ground whereby the students get firsthand experience of a new culture, its traditions and values, which broadens their views about life, narrows the boundaries and enables them to adjust with different people and strengthen bonds.